Translation, wrote Friedrich Schleiermacher, is a matter not only of articulation, but also of choice. In preparing established works for new audiences, one must weigh an author’s inflection against foreign circumstance; never a simple 1:1, translating demands an active negotiation of format, fidelity and, necessarily, of license, the process unfolding as a series of balancing acts—between upkeep and update, literalism and naturalization, content and context. In their efforts to restore Teiji Furuhashi’s landmark work Lovers (1994)—an elaborate, computer-driven environment anchored in early-‘90s machinery—MoMA's conservation department shared similar concerns. In subject, Lovers is a meditation on personal intimacy and political defiance conceived in anticipation of death. (The work, Furuhashi’s last, was produced as he battled the AIDS-related illness to which he’d succumb in 1995.) 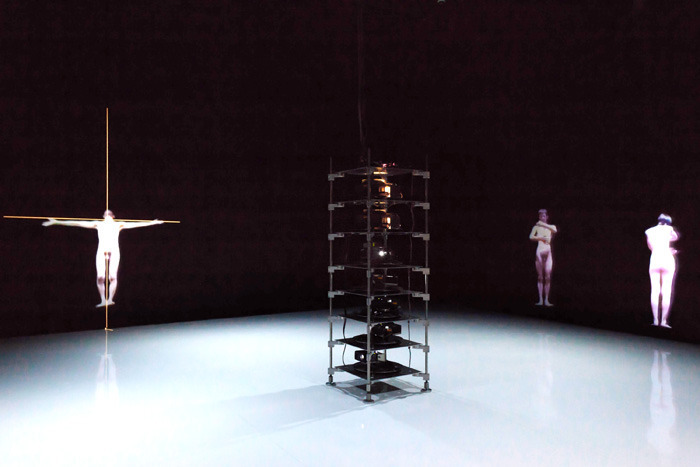 In its construction, meanwhile, Lovers was an achievement almost without precedence in contemporary art: developed in collaboration with a Japanese technical laboratory, the piece was an amalgam of cutting-edge mechanics, its merging of new media with performance art echoing Furuhashi’s work as a member of the Kyoto-based collective Dumb Type. Both conceptually and technically, Lovers was a work entirely of its time, making it a subject of much curatorial interest today—but also, given its dependence on outdated formats, an especially difficult piece to restore. On view through April, MoMA's current exhibition of Lovers is the work’s first public showing in nearly twenty years and reflects an immense undertaking by the museum’s preservation team. To mark the occasion, Media Conservator Ben Fino-Radin offers a behind-the-scenes look at the strategies involved in bringing Lovers to a contemporary audience. This latest staging of Lovers presented a unique set of challenges to MoMA's conservation team. What made the piece such a difficult one to restore? Well, it’s an incredibly complex work in its own right, with a panoply of media and formats operating in concert. On top of that, this intricate arrangement had been powered by technologies from the early ‘90s, all of which are now archaic, at risk of failure and, for the most part, irreplaceable. So going into the project, we knew that rather than simply “restoring” this composition, we’d actually have to reimagine it. That's often the case with time-based media works, especially at a museum like ours: a fair amount of time can pass between public appearances, and a lot can happen in the interim, both in terms of institutional knowledge and the inevitable technical obsolescence. So in taking these works out of storage and preparing them for exhibition, it’s not just a matter of dusting them off and polishing them up—it becomes a process of total reanimation. This was especially true with Lovers. On a technical level, what kind of issues were you facing? First of all, it was clear that we’d have to replace all of the original equipment that operated behind the scenes to power and control the piece. 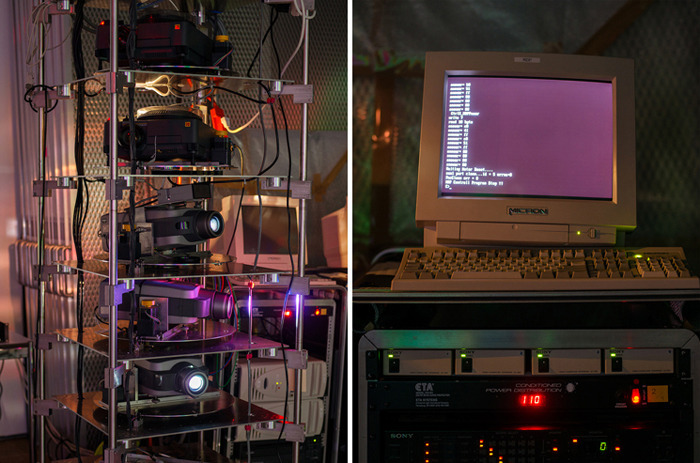 All of that intricate hardware and software—from the synchronized LaserDisc players to the PCs (running DOS) that controlled not only the video playback, but also the motion of the motors and the piece's interactivity—would have to be captured, item by item, and migrated to contemporary platforms, where we could reconfigure them in ways that could be more easily maintained. But in order to do that, we knew we would have to break apart Furuhashi’s original software, figure out the logic at work, and rebuild it as part of an entirely new operating system. To that end, we brought in outside engineers like Mark Heller and Ranjit Bhatnagar, whose contributions to the project were absolutely crucial. 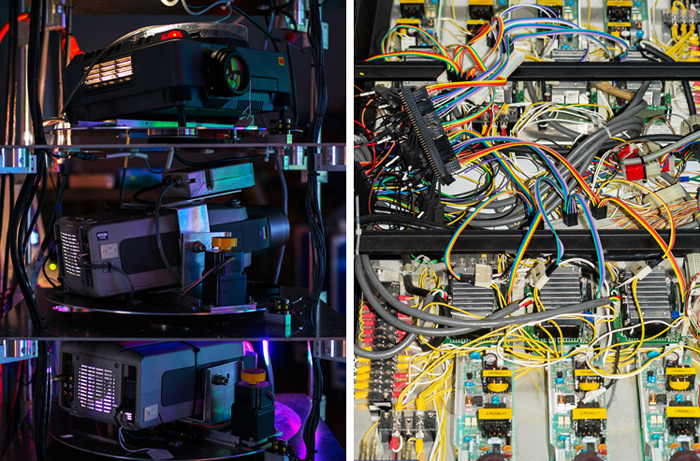 Through their combined expertise, we eventually made it so that this complex, unwieldy arrangement could now run off of a single Mac mini and a few Arduinos. As conceived, Lovers unfolds as an interwoven cycle of projections, almost like a choreographed score. In making your way through Furuhashi's original design, how clearly was that sequencing laid out? It wasn’t, which actually presented us with one of our biggest challenges. Although Lovers was expertly modeled, it was also completely embedded in the technology of the time. Particularly in the case of the work’s "score," we discovered that Furuhashi’s original control software was now inscrutable—the sequence was hard-coded into the software, which made it impossible to access. This was a real problem. Today, it’s fairly simple to design software that would control stepper motors, sync multichannel audio and video, and facilitate interactivity. But here, we could only recreate the effect if we had precise documentation of how the original software operated—and that was no longer available. So how did you work around that? We basically had to reverse engineer the entire work. In terms of instruments, we relied primarily on a device called a logic analyzer, which allowed us to record and measure the electronic pulses being sent to the motor controllers by the PCs. Using that information, we'd hoped to reproduce the motors’ exact movements. But as with any score, the process is as much about time as it is about motion, which is where an entirely new problem arose. Lovers doesn’t have a set duration per se, but it does unfold in a finite manner over the course of about fifteen minutes. Unfortunately, there aren’t any logic analyzers, digital oscilloscopes or data loggers that can record for that long. We couldn’t just “press play” and document the entire work at once. So Mark and I ended up having to improvise some new methods specifically designed to work in tandem with the logic analyzer: custom Python scripts, precision audio and video recordings, data visualizations, spreadsheets, you name it. After some trial and error, we were able to devise a system that accurately reproduced the original sequence in its entirety. It was definitely a challenge, but in the end, we not only generated the first truly accurate documentation of Lovers, but also created some new strategies that will likely prove invaluable in restoring other works in the future. Following that last point, I'm always struck by how, as a conservator, one consciously views his or her work as part of a continuum. On one hand, you hope your efforts might extend a broader, shared discourse, but at the same time, you know that even the most well-advised methods could be deemed unsound by future conservators. Definitely. To me, one of the most exciting things about this field is that it’s constantly evolving—not just in terms of technical practices, but also in the philosophies that inform them. This is why, as responsible conservators, we’re guided by two essential practices: minimal intervention and reversibility. Especially in dealing with media-based artworks, so much of what we do is preventative—producing backups, working on safe copies rather than the artwork itself, engaging the original piece only as necessary. We also make sure to generate detailed documentation of our process, which will allow future conservators to understand what we’ve done and, if necessary, to undo it. In the end, our true goal is to ensure that the work remains accessible to future generations, which includes not only the viewers, but historians, researchers, curators, and other conservators as well. Still, you’re not just keeping the work from expiring—you’re making decisions that have a direct impact on how it'll be experienced and understood in the future. There's an interesting moral component to that. Oh, absolutely. It’s a major responsibility, one that none of us takes lightly. But in conservation, it really just comes with the territory—especially when you’re working with time-based media works. 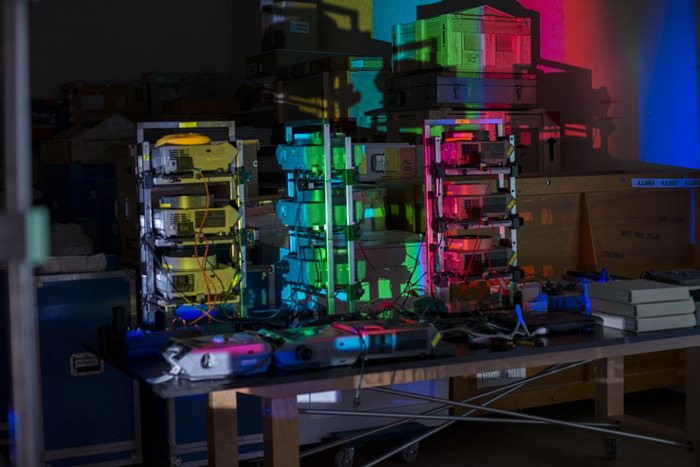 With a piece like Lovers, time makes certain decisions for you: the work involves a diverse and layered legacy of technologies, and technologies age a certain way, so some amount of change is unavoidable. Knowing that, we simply try to make informed decisions and do our best to keep each piece intact. It should also be pointed out, however, that these decisions are never ours alone—they’re made in concert with our curatorial colleagues and, whenever possible, with the artists themselves. Together, we arrive at a consensus as to what’s acceptable and what isn’t. We've been discussing the piece's interior workings thus far, but what about the technologies outwardly employed in Lovers—the tower, the video projectors? Did those elements present similar challenges? Certainly in terms of access and reliability. 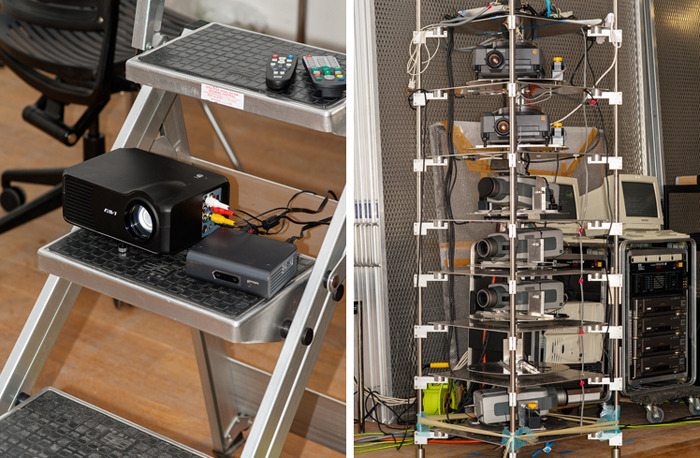 Video projectors can and do fail during the run of an exhibition, and so with Lovers, as with any other work, we needed to acquire spare pieces so that we could replace the existing items if need be. But in this case, the equipment was an old and very specific type of early LCD projector, and we found that even with considerable time spent scouring the Internet, we couldn’t find enough extra lamps to mount the work, let alone backup projectors. At that point, we knew we had to replace the original machines with a more contemporary model, so my colleague Kate Lewis began the painstaking process of finding projectors that had visual characteristics similar to the originals, yet were easily acquired, serviced and replaced. We then worked with a custom fabricator to design and build new mounts to house the projectors, once again making sure the results matched the look and feel of the original. Why was it so important to retain the original appearance? Did you have reason to think, for instance, that this particular model of projector served an aesthetic role beyond its basic functionality? Not necessarily. More than anything, it was just a question of fidelity. In restoring a given work, our goal is always to intercede only as absolutely necessary; whenever possible, we prefer to show each given work with all the original equipment. Not only is it the most faithful to the original design, but it’s also just easier that way, and usually far less expensive. But, of course, it all depends on how readily available those materials are. In the case of Lovers, if we could have found seven more of those projectors, we’d have used them, but they simply don’t exist anymore, so we had to bite the bullet and replace them. In doing so, however, we still had to be mindful of those visual details and change the work’s appearance as little as possible. To be clear, it’s not a matter of worshipping the technology. Obviously, we go to great lengths to ensure that works are presented as intended, but sometimes you have to accept some degree of variance. Otherwise, one can easily get caught up preserving elements that perhaps aren’t the real point of focus. As conservators, our responsibility is to retain an authentic viewing experience, which means remaining as loyal to the original presentation as possible while still allowing for change. Given your inability to consult with the artist directly, what role did existing documentation play in guiding those decisions? What sorts of materials were available to you? Documentation is always a crucial part of the conservation process—especially with a work like Lovers, where the arrangement is so complex and the piece has been shown in different iterations over the years. Going into the project, we had access to a folder that contained a range of materials, from wiring diagrams and elevation charts to previous correspondence between curators and conservators. But as invaluable as these materials were to us, they were hardly complete; there were still any number of unanswered questions surrounding things like proper light levels, projection alignment, and configurations for the work’s sound channels. We were at a loss there, which is why our conversations with Shiro and Yoko Takatani, two of Teiji’s closest collaborators, became so important. They've been active participants in this process? Yes, completely. 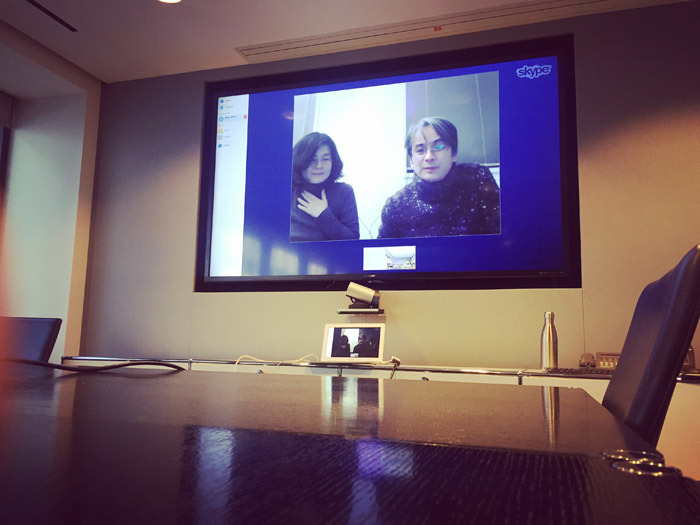 We’ve been in constant communication with both of them, especially Shiro—not only via email, but also through a series of in-depth videoconferences, all aimed towards filling in the blanks, down to even the smallest details. For example, two of the original projections had a subtle pixilation pattern to them, with slight RGB separation, while the others didn’t. As our documentation didn’t list this as a specific element of the piece, we couldn’t be sure if it was intentional or simply a technical issue. Shiro was extremely helpful in helping to resolve those sorts of questions. Later, when the two of them were able to travel to New York, he and I spent hours observing the piece, refining the playback until we were confident we'd achieved a successful installation. So they ended up being an invaluable resource to us, and really became our collaborators over the course of the project. Although Shiro and Yoko worked with Furuhasi as members of Dumb Type, Lovers stands apart for being the only piece he presented under his own name. As such, I wonder how direct their initial involvement might have been in the work's conception and/or implementation? Well, it was definitely Teiji’s piece, but because of his illness, he was in the hospital for a good part of the work's production. It was actually Shiro who was largely responsible for executing the piece, personally supervising its installations and exhibitions up until MoMA's acquisition of the work in 1998. So he wasn’t just a colleague or bystander—he played a direct and crucial role in its realization. As such, he’s been an invaluable resource, not just in terms of technical strategy, but also in gaining a clearer sense of Teiji’s overall intentions. As someone with unique insight into the work as originally designed, do you consider its technical complexity a meaningful conceptual element in itself, or simply a reflection of what was available to Furuhashi at the time? That's an interesting question. I think the engineering involved in realizing Lovers embodied a certain elegance and simplicity: it accomplished something quite complex in a technologically concise manner. If one were to execute the same work today, given the incredible array of available tools, I do think the execution of the work would be a simpler affair. That being said, as a conservator, I operate on the basis that an artwork’s materials are intrinsically part of its meaning. You can’t separate the two. Lovers is very much tied to the time it was made. The piece was created right on the bleeding edge of what was possible in the early ‘90s; because Furuhashi produced the work in collaboration with an art & technology lab, it was expertly engineered, totally state of the art. Every aspect of the composition—sculpturally, mechanically, electronically—is pretty much flawless, down to the smallest finishing. This was very clearly an artist who wanted to work with the latest technologies available, to develop new applications through his art. So I think one can safely assume that if Furuhashi was creating Lovers today, he’d almost certainly choose a different approach, utilize different equipment. But that also means he’d have likely ended up with a completely different work. So, all said, how long did the process of restoring Lovers take? In terms of concerted effort, just about four months. That seems incredibly brief, given the workload involved. Is that a typical turnaround for a project like this? Not at all. What we’ve done here with Lovers would usually take years to complete. That’s not to say that we’ve rushed things, but we’ve definitely devoted a lot of time and focused effort to working on this piece, simply because we knew the opportunity might not come again. First, there was the age and rarity of the equipment itself. On a technical level, this is work that literally couldn’t be done again, even ten years from now. But the other, equally important factor was purely logistical. Conservation at a museum the size of MoMA is more or less dictated by the exhibition schedule. We don’t really have time to take on projects at will; we have to focus on making sure that the things going on view are protected and, particularly in the case of time-based media works, can be shown without breaking down. Considering Lovers hadn’t been shown in nearly twenty years, we knew that we needed to take this opportunity and do the necessary work, as it could be a very long time before the chance came again—by which time it would almost certainly be too late. So in that sense, we were lucky that this exhibition happened when it did. It really was perfect timing. Ben Fino-Radin is a New York-based media archaeologist, archivist, and conservator of born-digital and computer-based artworks. He is the co-founder of Small Data Industries, a consultancy geared towards the preservation of media-based art.